What's not to love about quiche? Flaky crust, filled with limitless combinations of cheesy yumminess! I must confess, I love anything with a flaky crust as its container! 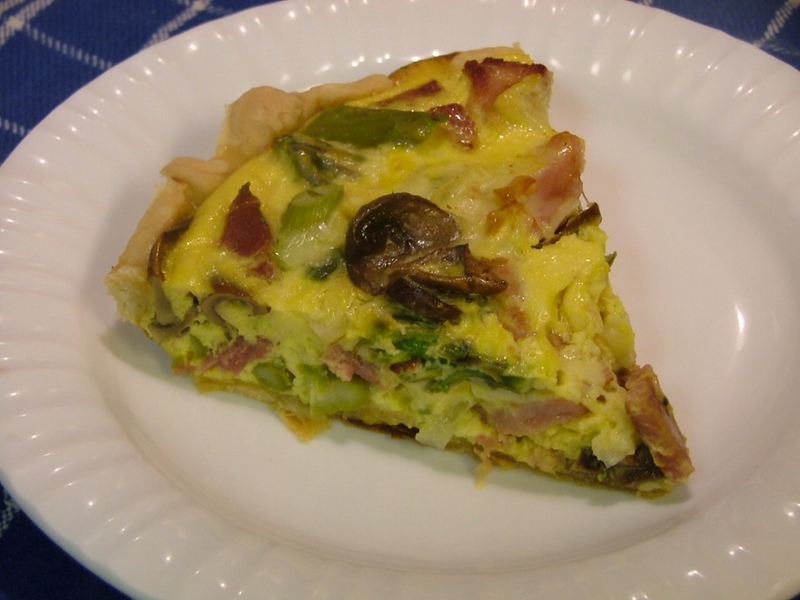 I found this particular quiche recipe in The Arizona Republic food section and adapted it to my preferences. The newspaper article stated, "It's true that eggs are packed with cholesterol, but medical researchers now say that dietary cholesterol isn't nearly as dangerous as once was thought. Only some of the cholesterol in food ends up in your bloodstream, and if your dietary cholesterol intake rises, your body compensates by producing less cholesterol of its own.". Can anyone say Dah?! I always knew God wouldn't create a perfect food, like the egg, and then have it be bad for us! That just plain never made sense to me! And while we're on the subject of health, you will never find my recipes using vegetable shortening or margarine! Both contain transfats and should be avoided! These are choices we need to make for the benefit of our families. What I love about quiche the most is it's versitility. . . You start with a killer crust and then add whatever you like or have on hand. No Swiss cheese on hand? No problem. Colby Jack works, this time I used Jarlsberg because I had it on hand, but an aged Provolone would be great too! Your filling needs to equal a heaping 4-cups of what you like, including the 4 eggs, 1/4 cup milk and 1/2 cup heavy cream, salt and pepper. So, let's examine how to make a quiche. Prebaking the crust gives you a crust that won't become soggy and remains flaky. Here's a basic pie crust recipe from Linda Hopkins, adapted by me. It's both simple and good! What's better than a warm slice of quiche? Two slices! 1 1/4 cups all-purpose flour (I use unbleached for added nutrition). You can use a food processor but, I prefer making my crust by hand. In a 4-cup measuring bowl, add flour and salt and whisk together. Add chilled butter pieces to flour and cut into flour with a pastry blender, or two butter knives until mixture resembles coarse meal. Add enough ice water to just bring dough together. Gather dough into a ball and refrigerate in plastic wrap for 30 minutes. Pat dough into a flattened circle. Roll out dough on a lightly floured surface with a lightly floured rolling pin. Roll dough from the center outward in all directions, forming a 13-inch round. Next, fit dough into an 11-inch tart pan and trim off the excess dough or a 10-inch pie pan folding dough under and making pretty edge. Chill until firm. Line crust with foil, fill with pie weights or dried beans and bake for 15 minutes. Remove foil and weights and return to oven until crust is golden, for about 10 minutes. 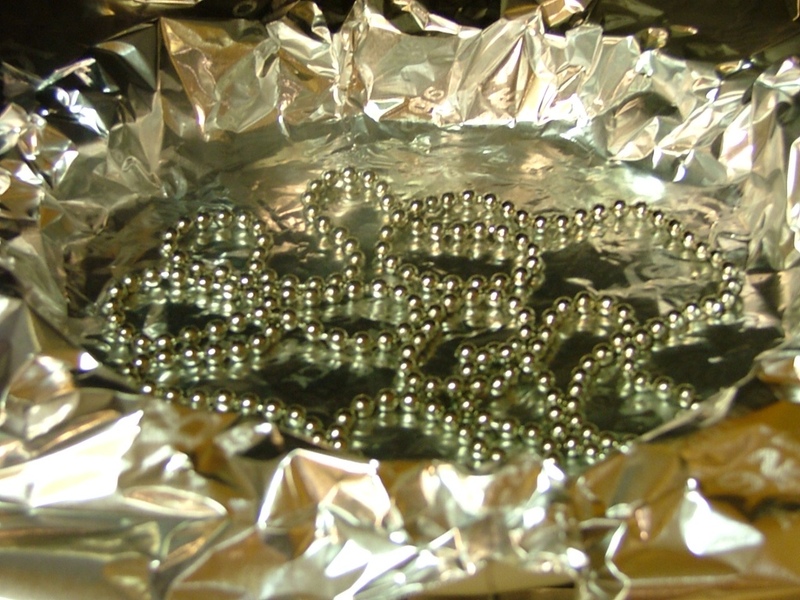 Aluminum foil with pie weights for baking "blind" pie crust. Dry beans can also be used and saved to use over again for making blind pie crusts. This is where it gets fun! You get to decide what you want in your quiche! Start with 1 prebaked quiche crust. 1 medium onion thinly sliced, about 1 cup and 1/2 teaspoon salt. 1 cup mushrooms, cleaned and sliced. 1 heaping cup asparagus or broccoli cut into bite size pieces. Alternatives could be spinach or artichoke hearts. Remember, it's about what you like! 1 cup cheese of your choice. I personally like a stronger tasting cheese. In a frying pan over medium heat add 1 tablespoon butter and sauté onion until soft and translucent. Set aside. In same frying pan add ham and cook on medium heat until lightly brownedon both sides, about 3 minutes. Set aside. 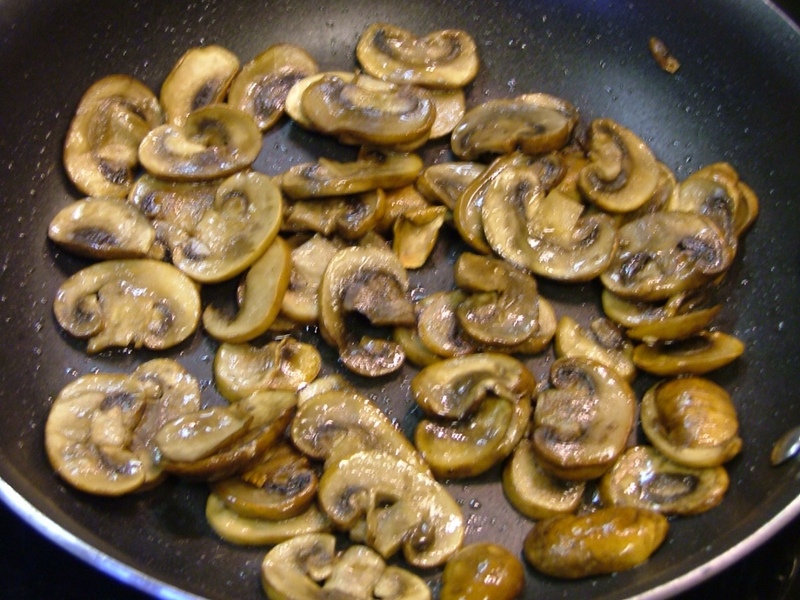 Add 2 tablespoons of butter to frying pan add mushrooms and cook on medium heat until lightly browned on both sides. Set aside. In small sauce pan add 1-inch water, 1/2 teaspoon salt and asparagus/broccoli. Bring to water to boil, turn down heat to simmer and cook asparagus/broccoli 3 minutes. Drain and set aside. In a large bowl, beat eggs with milk and cream. Stir cooled mushroom mixture into egg-cream mixture. 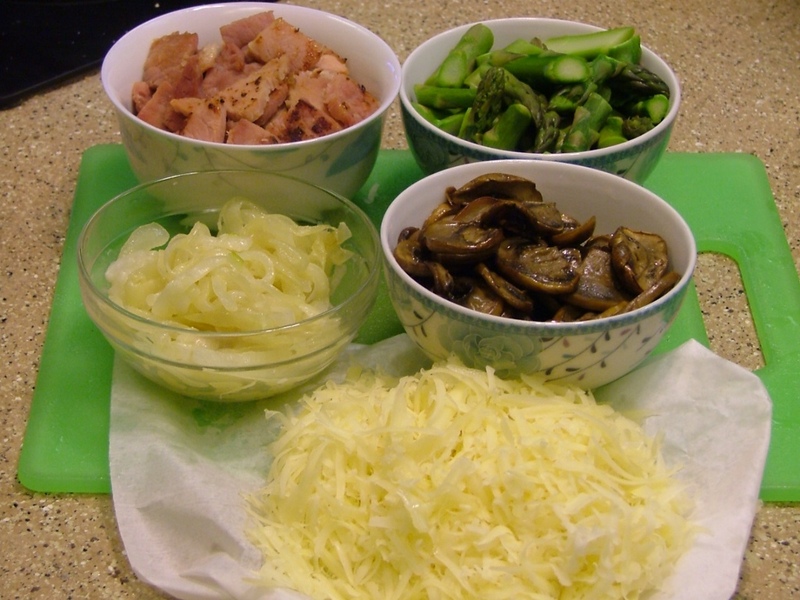 Add ham and stir to distribute ingredients evenly. Pour into tart pan or pie pan top lightly with aluminum foil used in baking crust. Bake 60-65 minutes. Test by inserting knife into middle of quiche. Knife should come out clean. Remove from oven and allow to set for 10 minutes before slicing and serving. Cooked veggies and shredded cheese. While this crust isn't the prettiest, the light, tender flakiness and flavor were spot on! When baking a "blind" pie crust it's easy to end up with a pie crust that shrinks down a little. I made the pie dough and was planning on making the filling and baking it all in the same day but was waylaid. By the time I got to the dough, a day later, it was very difficult to work with because it was too cold. Hence, the deformed, but absolutely delicious crust. Did I tell you I love pie crust? With practically any filling? 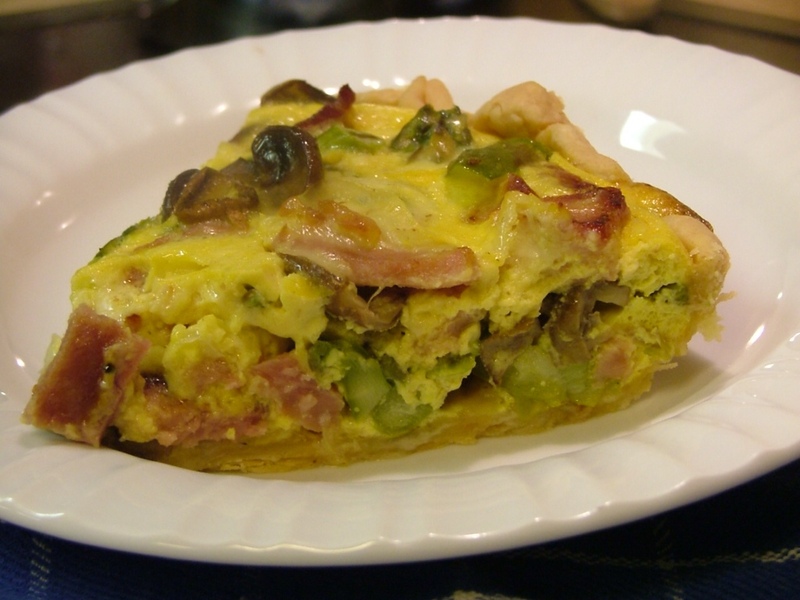 This quiche makes a fancy main course for breakfast, brunch, lunch, luncheon, dinner or supper. Add a salad and some fruit, like a couple strawberries, grapes or melon pieces and you have loveliness on a plate! At least that's the way I see it . . . Over at Julie's!! !